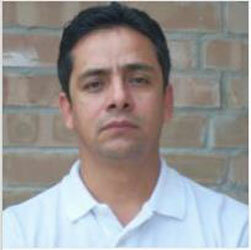 Daniel Estrada has joined Strongwell as the Maintenance Engineer for STRONGWELL S. de R.L. de C.V.
We are pleased to announce that Daniel Estrada has joined Strongwell as the Maintenance Engineer for STRONGWELL S. de R.L. de C.V. Daniel will report to Antonio Garza and will coordinate and oversee all facility and equipment maintenance functions of the Mexico facility. A native of Matehuala, San Luis Potosi, Mexico. Daniel received his Mechanical Engineering degree from Universidad Autonoma De Nuevo Leon. Daniel has held several positions in the steel industry; most recently as Manager for Ferza Oil Services Co. in McAllen, Tx. Daniel resides in Apodaca with his wife Marcela and his three children Juan, Joanna and Jair. In his free time Daniel enjoys outdoor activities with his family and is a big fan of sports. His favorite basketball team is the San Antonio Spurs, football team is the Denver Broncos and soccer team is the Tigres of UANL. Please offer your full support and join us in welcoming Daniel to Strongwell.